Some time ago I told you how you could make a Fresh herb tincture and what some of the thoughts, including pros and cons, are behind using this type of tincture. However, there is another way that tinctures can be made which has it’s own advantages and disadvantages. This type of tincture is a little more involved than the previous one I shared with you; so let’s go over the pros and cons first. Certain constituents (phytochemicals) in plants extract best into certain types of liquids. For example, some phytochemicals extract best into water while others extract best into alcohol. So if you’re making a tincture with a plant that extracts well into water (e.g. tannin rich plants) then you only want enough alcohol to preserve the tincture, but if you are making a tincture of a plant who’s phytochemicals extract best into alcohol (e.g. resin rich plants) then you need a higher percentage of alcohol for your tincture. Since fresh plant material always has an unknown quantity of water already in them you can’t know what percentage of alcohol you are working with. Plus it’s hard to know how much of the weight of the plant is water and how much is the plant itself. Controlling these ratios means that you are extracting what you intended from the plant. This way you can have a better idea of what is a safe dose to take/use, especially if you’re using herbs with narrow therapeutic windows of safety. As with the fresh tincture, they still have a long shelf life and can still be made at home quite easily… if you’re up for a little bit of extra effort. Some people feel that using dried plant material means that you lose the energetic benefits that the plants have to impart. However, many ancient herbal traditions that stress energetics also have a long history of using dried herbs. To me, the biggest problem with this method is the math. Yes, this method requires math! This method is a little a little more work to make compared to the fresh tincture method, which is so easy. Enough alcohol of the right alcohol content (example: 25%, 40%, 95%). I tend to use 180 proof which is about 95%. I’ll explain why shortly. Clean cheese cloth or something similar for straining. I use clean undyed cotton cloth. Most of the tinctures I make are in a ratio of 1:5. This means that you use one part herb to 5 parts liquid. Usually I use 100 g of herb to 500 ml of liquid. Now you need to know how much alcohol vs. water you need. First determine what the herb you’re using usually extracts best in. If it’s an herb commonly used as a tea, then it probably needs just enough alcohol for preservation; if it contains alkaloids then you may want somewhere around 45% alcohol; if you are using a resinous herb then you’ll need as close to 100% alcohol as you can get. This is why I use the 180 proof – I only have to store one type but I can make any percentage alcohol tincture that I may need to. If you don’t know what percentage to use, most good herbal books will tell you what major plant phytochemicals a plant contains, and many of them talk about the traditional percentages that have been used for these plants. You can also look these phytochemicals up (i.e. Google) to see what they will extract best into. Here’s a formula you can use to figure out how much water vs alcohol you need to use. Once you have your answer, in this case 342.105 ml of a 95% alcohol, you just add enough water to bring it up to 500 ml total liquid. Put the liquid in the jar along with the herb, seal it, and label it. Store it in a cool (not the fridge) dark place and shake it each day. 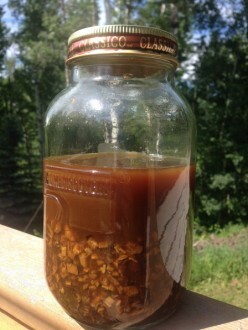 In two weeks your tincture should be ready to strain, bottle, and use. A small wine press, or something similar, is a very useful tool for extracting the most liquid out of the plant material. I highly recommend to always label your tinctures with the name of the plant and/or plant part, the date that you made it, the ratio of the plant material to liquid (i.e. 1:5), the percentage of alcohol, and the dose that is safe to take. There you have it! Another way to make tincture. Use whichever one you are most comfortable with and fits best with the plants that you intend to use. Have you ever tried Dandelion coffee? Where do you get 180 proof in Ontario or Canada for that matter? The only source we’ve been able to find is called Everclear, but there are some suppliers, sometimes for laboratories, that offer others, including a sugar cane based one, if you can afford it. We’ve been in contact with someone who is trying to make better quality (and reasonably priced) alcohols for tincture making available in Canada – we hope they succeed. Any updates on the canadian ever clear supplier? Maybe some good organic small distiller may decide to come forward to provide a reasonably priced, quality (perhaps tasty?) product, suitable for making tinctures, including tinctures of resinous herbs. They would make a number of herbalists very happy. Hint hint.